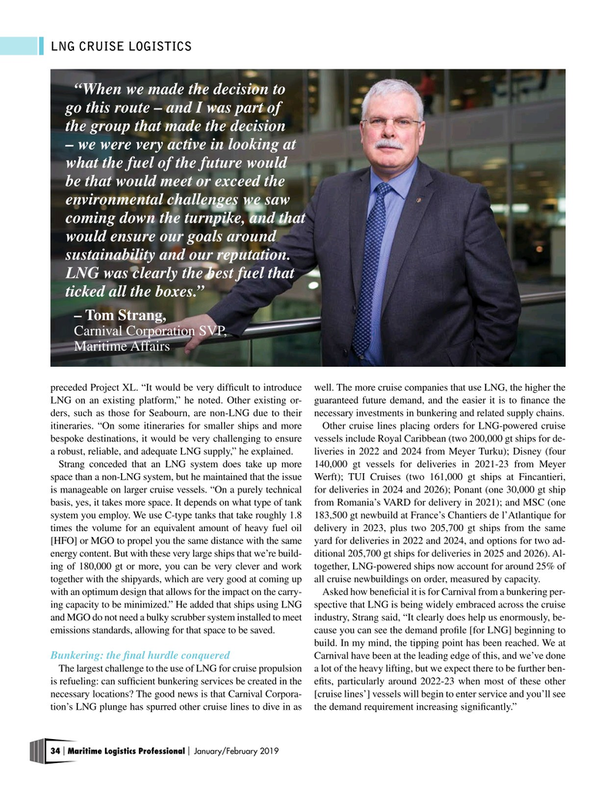 LNG CRUISE LOGISTICS “When we made the decision to go this route – and I was part of the group that made the decision – we were very active in looking at what the fuel of the future would be that would meet or exceed the environmental challenges we saw coming down the turnpike, and that would ensure our goals around sustainability and our reputation. Strang conceded that an LNG system does take up more 140,000 gt vessels for deliveries in 2021-23 from Meyer space than a non-LNG system, but he maintained that the issue Werft); TUI Cruises (two 161,000 gt ships at Fincantieri, is manageable on larger cruise vessels. “On a purely technical for deliveries in 2024 and 2026); Ponant (one 30,000 gt ship basis, yes, it takes more space. It depends on what type of tank from Romania’s VARD for delivery in 2021); and MSC (one system you employ. We use C-type tanks that take roughly 1.8 183,500 gt newbuild at France’s Chantiers de l’Atlantique for times the volume for an equivalent amount of heavy fuel oil delivery in 2023, plus two 205,700 gt ships from the same [HFO] or MGO to propel you the same distance with the same yard for deliveries in 2022 and 2024, and options for two ad- energy content. But with these very large ships that we’re build- ditional 205,700 gt ships for deliveries in 2025 and 2026). Al- ing of 180,000 gt or more, you can be very clever and work together, LNG-powered ships now account for around 25% of together with the shipyards, which are very good at coming up all cruise newbuildings on order, measured by capacity.